One of my favorite dishes whenever we go out is the cheese dip. I am so hooked up on appetizers in general that some times I just like to combine a couple of them into a full meal but cheese dip will always be a part of the experience. I tried various combinations over the years and I think my fave was a cheese and spinach mix but to remain true to my food blogger spirit I made mine with mushrooms instead. Heck, is all about trying new things, right? My recipe is a combination of three different types of cheese mixed with sauteed mushrooms along with a couple other interesting ingredients. 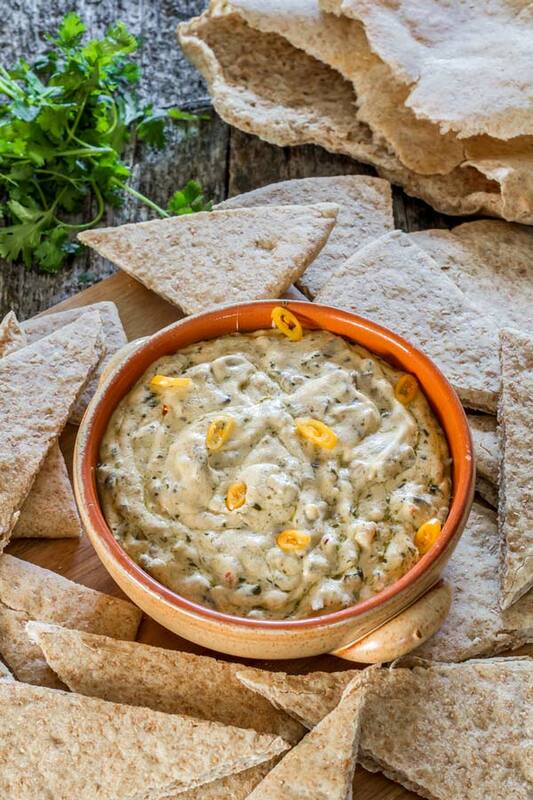 Some of them are not mandatory, like pesto for example, but if you want to share the same experience I had when enjoying this dip, then you have to stick to my recipe. I also made my own pita chips, so go visit my baking website and check out that recipe as well, it will definitely be worth it. Enjoy! In a frying pan and a tablespoon of olive oil and sautee the mushrooms until all the water is gone and they become a bit crinkled (maybe 10-15 minutes). Preheat oven to 425° F / 220° C and mix all the ingredients directly in a oven resistant pan; add salt and peeper to taste. Bake for 20 to 25 minutes or until all cheese is heated through, melted, gooey, awesome. No way! I’m defiantly going to try this one. Keep going on with your recipes, they are really good. This looks fantastic! Yum!! Will definitely have to try this soon.